In his rejoinder to my article, “Preserving cultural identity and subjectivity for a psychology of multiculturalism,” Allwood (2014a) proposed a series of questions awaiting further clarification. A careful examination of his questions indicates that most of them can be attributed to the divergent standpoints between us. As an outside observer to the indigenization movement of psychology, Allwood (2014b, c) concerns about “an appropriate culture concept for the indigenous psychologies,” “what type of culture concept will help the indigenous psychologies?” But, as president of the Asian Association of Indigenization Movement of Psychology for more than thirty years, my ultimate concern is how to construct culture-inclusive theories for psychology of multiculturalism in the age of globalization (Hwang 2013a, b; 2014). The culture-inclusive theories of psychology constructed in accordance with “One mind, many mentalities” (Shweder et al. 1998), the principle of cultural psychology, may enable IPists to conduct empirical research on related culture concepts in any given society. As an outside observer to the movement, Allwood argues for a culture concept that the understanding of the specific individuals “is distributed in a society, rather than it is shared.” But as a pioneer and insider who has been seeking for the solution for the indigenization movement of psychology, I insist that IPists have to construct culture-inclusive theories first by considering what “is shared” by the majority of a culture group (Hwang 2013a), before conducting empirical research to understand how related culture concepts are distributed in a society. Without the assistance of culture-inclusive theories, non-Western empirical research in psychology will be dominated by Western theories of mainstream psychology. This is the most serious misunderstanding of Prof. Allwood. In fact, any psychological research consists of two steps: theoretical construction and empirical research. Emphasizing the shared understanding in a society is a necessary task for constructing culture-inclusive theories in psychology (Hwang 2013a), while studying the variation of the understanding prevalent in a society is the major task of empirical research. Let me elaborate my research program in more detail : In my earlier article entitled Linking Science to Culture: Challenge to Psychologists (Hwang 2013b), I emphasized that the indigenization movement of psychology is destined to solve a thorny problem which has been neglected by Western psychologists since the founding of scientific psychology. When Wilhelm Wundt (1832-1920) established his laboratory in Leipzig in 1879, he conducted experiments on “lower cognitive functions” using the method of controlled introspection on consciousness. He described his approach and research findings in Principle of Physiological Psychology (Wundt 1874/1904). Recognizing the restriction of this approach to understand “higher forms of human intellect and creativity” as represented in culture, he studied cultural issues in his volumes of Völkerpsychologie by historical methods (Wundt 1916). Soon after the launching of scientific psychology, Lev Vygotsky (1896-1934), a young Russian psychologist who was profoundly influenced by Western thoughts, also distinguished “lower” from “higher” psychological processes in 1927 for the sake of differentiating men from animals in phylogenetic continuity. Based on the distinction between “explanation of nature” and “understanding of human actions” formulated by Dilthey and Münsterberg, Vygotsky also distinguished two types of psychology: Causal psychology as a natural science aimed to study the cause-and-effect of lower psychological processes, and intentional psychology as a “spiritualistic” one aimed to understand human intentions as well as actions (Vygotsky 1927/ 1987). Because of his premature death at the age of 38, and because his work was criticized by the Communist Party in Russia, while Vygotsky was a contemporary of Pavlov, Freud and Piaget, his work never attained their level of eminence during his lifetime. Thus, the so-called intentional psychology has been relatively ignored by mainstream psychologists. In order to solve the problematic situation left by Wundt and to integrate both scientific psychology and intentional psychology as suggested by Vygotsky, in the first chapter of my book, Foundations of Chinese Psychology (Hwang 2012), I advocated that the epistemological goal of indigenous psychology is to construct a series of culture-inclusive theories to represent not only the universal mind of human beings but also the particular mentality of people within a given society in accordance with the principle of cultural psychology: “one mind, many mentalities” (Shweder et al. 1998). This principle indicates that the construction of culture-inclusive theory contains two steps. First, constructing a model to represent the psychological functioning or mechanisms of the human mind. Second, using this model to analyze a particular cultural heritage (Hwang 2014). In Chapter 4 of my book, I explained how I constructed the theoretical model of “Face and Favor” which represents the universal mechanism for social interaction, then I used it to analyze the inner structure of Confucianism and discussed its attributes in terms of Western ethics. In the remaining chapters of that book, I constructed a series of culture-inclusive theories of social psychology on the presumption of relationalism, which had been utilized to integrate previous empirical research findings on social exchange, face, achievement motivation, organizational behaviors, and conflict resolution in Confucian society. I have indicated several times that philosophy of science is mainly a product of Western civilization (e. g. Evenden and Sandstrom 2011). My research philosophy originated from Western culture, but I used my research strategy to construct culture-inclusive theories in a particular non-Western society (Hwang 2013a). The same strategy can also be applied to other non-Western societies. This kind of culture-inclusive theories are certainly founded on their own cultural premises. I don’t think that my research program risked changing them (non-Western cultures) out of recognition (unclear). In Chapter 1 of another book, A Proposal for Scientific Revolution in Psychology (Hwang 2011a), I also proposed a Mandala Model of Self as another universal model of human mind that may be used to study mentalities in any specific culture. Though I mentioned it in my previous debates with Prof. Allwood (Hwang 2013b), here I would like to elaborate on it in order to clarify some of Allwood’s questions. The focus of the Mandala model is the action taken by an individual in the lifeworld (see Figure 1). Self in this model refers to a socialized agent with reflexivity whose lifeworld can be represented by a mandala with the structure of a circle inside a square. 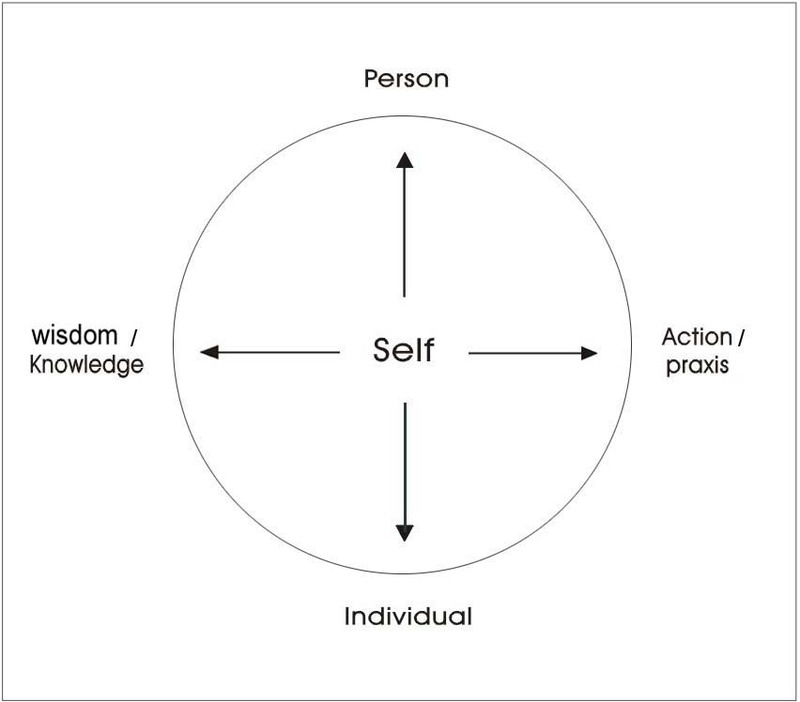 In Figure 1, self in the circle is situated in the center of two bi-directional arrows: one end of the horizontal arrow points at action or praxis, another end points at wisdom or knowledge. The top of the vertical arrow points at person, and the bottom points at individual. All of the four concepts are located outside the circle but within the square. The arrangement of these five concepts means that one’s self is being exerted by several forces from the lifeworld. But, all five concepts have special implications in cultural psychology which should be elaborated in more detail below. One of the bi-directional horizontal arrows directs to action rather than behavior as frequently used by psychologists; it refers to one’s action taken after reflection, rather than conceiving self as the black box mediating stimulus and response as viewed by behaviorists. The praxis under action means the action taken in accordance with a particular theoretical knowledge or a judgment made by a moral agent. The difference between person, self, and individual was raised by anthropologist Grace G. Harris (1989). She indicated that these three concepts have very different meanings in the Western academic tradition: individual is a biological concept, it regards human beings as a member of the human species who are of no difference to other creatures in the universe. Person is a sociological or cultural concept. It views a person as an agent-in-society who takes a certain standpoint in social order and plans a series of actions to achieve a particular goal. Every culture has its own definitions of appropriate and permitted behaviors, which have been endowed with specific meanings and values, and are transmitted to an individual through various ways of socialization. Self is a psychological concept. In the conceptual framework of Figure 1, self is the locus of experience, one who is able to take various actions in different social contexts, and one who is able to make self-reflections in attaining goals. On the contrary, self as the subject of agency, in my Mandala model is endowed with two important capabilities: reflexivity and knowledgeability. Reflexivity means that the self is able to monitor his/her own action, and able to give reasons for the action. Knowledgeability means that the self is able to memorize, store, and organize various forms of knowledge, and make them a well-integrated system of knowledge. From the perspective of psychology, an individual’s ability of reflexive awareness will result in the duality of self: Self as a subject who is able to integrate his/her own behaviors distinguishable from others, this is the basis of self-identity. Meanwhile, self has the ability to reflect and therefore knows one’s relationship with other objects in the world. Hence, one may regard oneself as part of a particular social group and acquire a sense of social identity. An individual’s self-identity and social-identity have very important implications for one’s self-reflection. In Figure 1, the horizontal bi-directional arrow points at wisdom/knowledge and action/praxis, and the vertical one points at person and individual, respectively. This means that the self in one’s lifeworld exists in a field of forces. When an individual intends to take action, his/her decision may be exerted by several forces, especially when one identifies with a particular social role. On the one hand, s/he has to think about how to act as a socialized person. On the other hand, s/he is pushed by various desires as a biological individual. When s/he takes action and encounters problems, s/he may reflect by using the information stored in his/her personal stock of knowledge. If the problem persists, s/he may take further steps to search for solutions from the social stock of knowledge. With the aid of my Mandala model, we may go back to discuss some of Prof. Allwood’s picky questions. Shweder et al. (1998) argued that, according to the principle of cultural psychology: “one mind, many mentalities”, mind means the totality of actual and potential conceptual contents of human cognitive process, which is determined by biological factors (Shweder 2000, 210). Mentality denotes cognized and activated subset of mind which had been cultivated and owned by a particular individual or group so that it can serve as subjects of research by cultural psychologists. It is a matter of course that my Mandala model fully “recognizes that there are many competing images of the identity in a specific culture.” In other words, Person in the Mandala model may denote any image of identity in a specific culture. If Prof. Allwood likes, he may construct a culture-inclusive theory of individual self on the basis of his understanding of Western individualism (in fact, we already have a lot of theories of this kind in mainstream psychology), in addition to studying its distribution in any non-Western culture. However, without the construction of such culture-inclusive theories as models of Confucian relational self, Taoist authentic self, or Buddhist non-self, how can we know the potential images of the identity in Confucian culture? How can we conduct empirical research to study the distribution of those cultural understanding in Confucian society? Allwood, Carl Martin. “On the Advantages of an Empirically Oriented Culture Concept in the Indigenous Psychologies.” Social Epistemology Review and Reply Collective 2, no. 8 (2013a): 60-65. Allwood, Carl Martin. “On the Virtues of an Empirically Oriented Culture Concept and on the Limitations of Too General and Abstract Characterizations of Understanding.” Social Epistemology Review and Reply Collective 2, no. 11 (2013b): 54-61. Allwood, Carl Martin. “Culture, Language, Identity and the Properties of a Useful Culture Concept for the Indigenous Psychologies.” Social Epistemology Review and Reply Collective 3, no. 10 (2014a): 30-33. Allwood, Carl Martin. “What Type of Culture Concept Will Help the Indigenous Psychologies and Why? An Answer to Hwang.” Social Epistemology Review and Reply Collective 3, no. 7 (2014b): 44-49. Allwood, Carl Martin. 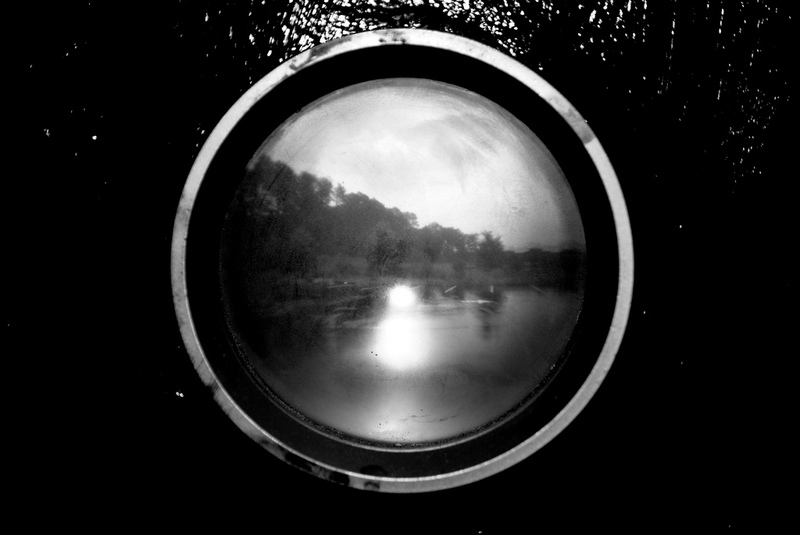 “On the Issue of an Appropriate Culture Concept for the Indigenous Psychologies and on the Limits of Philosophy.” Social Epistemology Review and Reply Collective 3, no. 3 (2014c): 41-48. Cole, Michael. Cultural Psychology: A Once and Future Discipline. Cambridge: Harvard University Press, 1996. Cole, Michael and Parker, M. “Culture and Cognition.” In Cross-cultural Psychology: Contemporary Themes and Perspectives, edited by Kenneth Keith. Chichester, UK: Wiley-Blackwell, 2011: 133-159. Evenden, Martin and Gregory Sanstrom. “Interview-Calling for Scientific Revolution in Psychology: K. K. Hwang on Indigenous Psychologies.” Social Epistemology 25, no. 2 (2011): 153-166. Harris, Grace G. “Concepts of Individual, Self, and Person in Description and Analysis.” American Anthropologist 91 (1989): 599-612. Hong, Ying-yi. “A Dynamic Constructivist Approach to Culture: Moving from Describing Culture to Explaining Culture.” In Understanding culture: Theory, research and application, edited by Robert S Wyer, Chi-yue Chiu, and Ying-yi Hong. New York, NY: Psychology Press, 2009: 3-23. Kashima, Yoshihisa. “Is Culture a Problem for Social Psychology?” Asian Journal of Social Psychology 8, no. 1 (2005): 19-38. Kim, Uichol, Yang, Kuo-Shu S, and Hwang, Kwang-Kuo. “Contributions to Indigenous and Cultural Psychology.” In Indigenous and Cultural Psychology: Understanding People in Context, edited by Uichol Kim, Kuo-Shu Yang, and Kwang-Kuo Hwang. New York: Springer, 2006: 3-25. Hwang, Kwang-Kuo & Chang, Jeffrey. “Self-Cultivation: Culturally Sensitive Psychotherapies in Confucian Societies.” The Counseling Psychologist 37, no. 7 (2009): 1010-1032. Hwang, Kwang-Kuo. A Proposal for Scientific Revalution in Psychology. (in Chinese). Taipei: Psychological Publishing Co., 2011a. Hwang, Kwang-Kuo. “Reification of Cultural in Indigenous Psychologies: Merit or Mistake?” Social Epistemology 25, no. 2 (2011b): 125-131. Hwang, Kwang-Kuo. Foundations of Chinese Psychology: Confucian Social Relations. New York: Springer, 2012a. Hwang, Kwang-Kuo. “Critical Realism and Multiple Philosophical Paradigms: The Construction of Culture-Inclusive Theories.” Paper presented at International conference on New Perspectives in East Asian Studies, June 1-2, 2012, Institute for Advanced Studies in Humanities and Social Sciences, National Taiwan University, Taipei, 2012. Hwang, Kwang-Kuo. “The Construction of Culture-Inclusive Theories by Multiple Philosophical Paradigms.” Social Epistemology Review and Reply Collective 2, no. 7 (2013a): 46-58. Hwang, Kwang-Kuo. “Linking Science to Culture: Challenge to Psychologists.” Social Epistemology 27, no. 1 (2013b): 105-122. Hwang, Kwang-Kuo. “Science as a Culture in Culture with Deep-Structure across Empirical Studies in Psychology.” Social Epistemology Review and Reply Collective 2, no. 10 (2013c): 38-51. Shweder, Richard A., Jacqueline Goodnow, Giyoo Hatano, Robert A. Levine, Hazel R. Markus, and Peggy J. Miller. (1998). “The Cultural Psychology of Development: One Mind, Many Mentalities.” In Handbook of Child Psychology: Theoretical Models of Human Development, 5th edition, edited by William Damon and Richard M. Lerner. NY: John Wiley & Sons, 1998: 865-937. Shweder, Richard A. “The Psychology of Practice and the Practice of the Three Psychologies.” Asian Journal of Social Psychology 3, no. 3 (2000): 207-222. Vygotsky, Lev S. The Historical meaning of the crisis in Psychology: A Methodological Investigation. NY: Plenum Press, 1927/1987. Wundt, Wilhelm. “Völkerpsychologie und Entwicklungspsychologie.” Psychologische Studien 10 (1916): 189-238. Wundt, Wilhelm M. Principles of Physiological Psychology. Translated by Edward B. Titchner. Cambridge: Harvard University Press, 1874/1904.